HB 193 signed into law: Georgians who request lapse or surrender of a life policy will now be informed of alternatives; agents safe to make disclosures. Atlanta, GA, April 27, 2016 --(PR.com)-- Habersham Funding LLC, heralds the passage in the recent legislative session of HB 193, known as the Life Insurance Consumer Disclosure Act. The Act provides that consumers will be better informed of their rights under a policy and that licensed life insurance agents will not be subject to retaliation for ensuring consumers are informed. Governor Nathan Deal signed the bill into law April 26. Atlanta-based Habersham does business nationally, providing the funds for life settlements, which enable seniors, and those who are terminally ill, to receive an advance cash payment for their policy. Most modern life policies contain these benefits, which might include the ability to get a loan against a policy or benefits like accelerated death benefit, nursing home benefit, critical illness benefit or the ability to get an advance cash payment through a life settlement. There are nearly 20 types of living benefits, with different life policies containing various numbers and combinations of those. Rep. Carl Rogers and Sen. Harbin are licensed life insurance agents, as is Freeman, who has been licensed for 37 years; he has focused on helping thousands access life insurance settlements and other living benefits for more than 25 years. 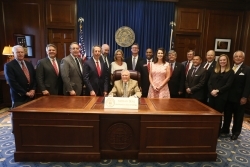 Some of those gathered at the signing of HB 193 include: Andy N. Siegel, CPCU, CIC, AAI, President of Independent Insurance Agents of Georgia; David A. Culley CLU, ChFC, Past President, Association for Advanced Life Underwriting; David S. Johnson, Board, Georgia Association of Health Underwriters; Don Bolia, Government Affairs Director, Georgia Association of Health Underwriters; Jerry Wright, CLF, LUTCF, Georgia Chapter President-elect, National Association of Insurance and Financial Advisors; Phil Smelley, CIC, Georgia Chapter Past President, National Association of Insurance and Financial Advisors; Rep. Ronnie Mabra, Secondary Sponsor of HB 193; Roy Cranman, AEP, CLU, ChFC, Atlanta Chapter Past President, Society of Financial Service Professionals; Kenneth Pendley, CLU, ChFC, LUTCF, Georgia Chapter Past President, National Association of Insurance and Financial Advisors; Rob and Christi Estes, Consumer Advocates and Founders of Can't Never Could, Inc.; and Rep. Carl Rogers, Principal Sponsor of HB 193. Life Insurance disclosures of this nature come as welcome news to health care advocates and the people they serve, as well as the life agent community. Supporters of HB 193, many of whom reached out to legislators about and even testified in committee hearings for the bill, include NAIFA (National Association of Insurance and Financial Advisors) Georgia, representing 1,043 agents in the state, as well as various NAIFA chapters throughout the state, including Atlanta South, Macon, LaGrange, Savannah and Statesboro. Likewise, organizations including Cure for ALS, the ALS Association, Georgia Chapter, MDA of Greater Atlanta, and Can’t Never Could endorsed the bill. Habersham Funding holds licenses in 40 jurisdictions which regulate the life settlement industry and can purchase life policies in 47 states and Washington, DC.